Once a property of Austro-Hungarian aristocracy, Villa Eugenia today is a modern, yet classy boutique hotel on the banks of Adriatic Sea. 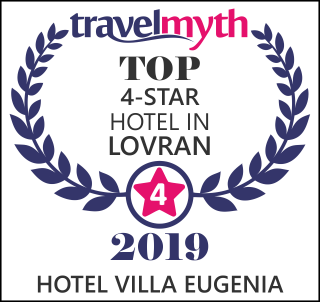 It is ideally located in the heart of a petit soulful historic town of Lovran, among aromatic pine trees and sparkling clear blue waters. Whether you wish to enjoy the trails of natural parks and reset your mind with the soothing sounds of waterfalls or bird singing, peacefully read your book on the beach, discover medieval historical sites or simply indulge yourself in the amazing traditional cuisine and wine tasting in the embrace of charming narrow streets, you have found your place. When you had enough of the outside world, we are here to pamper all your senses. Rest your eyes on the idyllic scenery of the Kvarner bay and listen to the waves meeting the shore. Smell the aromatic herbs in our Mediterranean garden, taste traditional dishes disguised in modern creations and feel the bliss after sauna and relaxing massage. Rooms on the top floor open up to the blue sky through the specially designed roof windows, just perfect for admiring the endless sea during the day or romantic stargazing in the night. Woke up from most beautiful dreams? Make them last by starting your day with a peaceful morning above the clear blue waters of Adriatic Sea. Green for the pleasant scent of the pine trees and blue for the magnificent sound of the sea. Soak up the sun, feel the light breeze and admire idyllic scenery of the Kvarner bay from your own balcony.